When innocent horseplay temporarily lands Andi and her friends in jail, they decide that a trip into the mountains will leave their troubles far behind. Accompanied by big brother Mitch and armed with a map showing old gold diggings, they can't wait to strike it rich. What could be better than two weeks of camping and horseback riding? But instead of gold they find heaps of trouble - trouble that leaves Mitch gravely wounded. Andi needs help fast. But who can she trust? And what good is a bag of gold when her beloved brother lies near death in the middle of nowhere? Right next to "Andrea Carter and the Dangerous Decision," Susan K. Marlow's "Andrea Carter and the Trouble with Treasure" has remained a favorite on my bookshelf. Thus, I was super excited to download the audible edition of one of my top favorite books! And once again, Mrs. Romano did not disappoint. 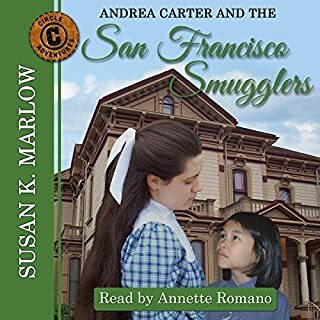 I can't tell you how many times I've reread the book "Andrea Carter and the Trouble with Treasure," and yet, with Mrs. Romano as narrator, the book is like new all over again! Five stars all the way! This is my 4th audiobook, and I'm still an absolute fan of Mrs. Romano! This book was especially great . . . considering it's not only a wonderful book to begin with, but also a 'narrated sneak peek' of the upcoming anniversary edition of this book - which isn't released until late February! I wasted not a second but downloaded this audiobook right away. So realistic a voice for Lin Mei, especially, and I'm still enjoying this fun audiobook! My ten-year-old sister is just as swept up in it as I am, and she begs constantly for more. Thank you so much, Mrs. Marlow and Mrs. Romano! These are the very best audiobooks EVER. God has truly gifted Mrs. Marlow with her ability to write a stay-at-the-edge-of-your-seat adventure, while His gift to Mrs. Romano of 'fantastic narrating' has kept me (and my sister!) in many enthralling moments. Thanks again! Here I was thinking I liked the as-is version of Mrs. Marlow's third book in the Circle C Adventures series. But no, it gets better! With Annette Romano as narrator, this book comes to life! You can literally 'see' Andi. You can leap on in and join her for her newest adventure: learning to cope with a sister she's never known she'd had. I've read this book before (many times, I might add), but still I get hooked on this audio book! Ms. Romano catches you with her strong, clear voice. So join me; download now and hit the 'play' button. After that, it's a whirlwind of adventure! Annette Romano is fantastic! Crazy over Mrs. Marlow's Andi books, I leaped at the opportunity to get one of her audiobooks, and boy, I haven't once regretted it! Annette Romano has a way with drawing someone (like me) in and keeping her hooked! She can do amazing things with her voice and have you exploding in gales of laughter one moment and then keeping you in breathless suspense the next. I'll say it again: Annette Romano is fantastic! Annette Romano and Susan K. Marlow are AMAZING! I must admit, I am normally NOT a fan of audiobooks. Narrators tend to make me cringe as I hear it and think, “That just spoils the whole book.” But Annette Romano is SUCH an exception to my earlier thought. She captured my attention as she creatively portrayed Mr. Foster’s severity. Her version of Jed Hatton’s voice strikes me with the thought, “That’s good.” And get this—not only were my sisters and I drawn in, but so were my brothers! We laughed and listened to Annette as she made “Andrea Carter and the Dangerous Decision” come alive. It was is as if we were with Andi in the book! 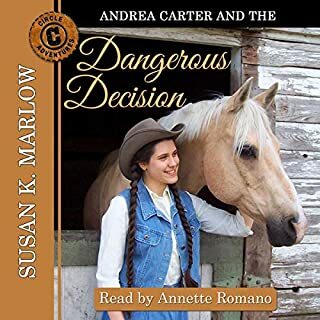 No one could’ve narrated “Andrea Carter and the Dangerous Decision” better. Thanks, Annette!